As of November , 2013, the Emerald Ash Borer (EAB) has not yet turned up in the Peterborough, although it is probably here. The closest confirmed infestations are along the southern shore of Rice Lake (e.g., Golden Beach Resort) and in the City of Kawartha Lakes. In Oshawa the devastation is quite noticeable with long stretches of dead trees on some streets. EABs are expected to be confirmed in Peterborough in early 2014. According to the Canadian Food Inspection Agency (Aug. 23), Peterborough will be put in a regulated zone with other areas already infested by the EAB even though the insect hasn’t been found here yet. This will lead to changes in the Peterborough area in how the federal government regulates the movement of ash wood products and firewood (especially important for commercially-produced firewood) in an attempt to slow down the spread of the EAB across southern and central Ontario. 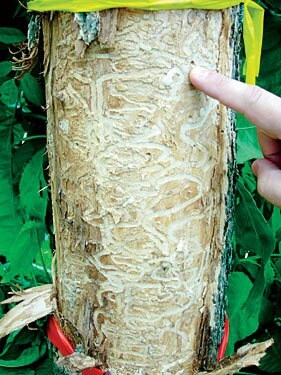 When the EAB is detected, it’s often two to seven years after the insect has first arrived. 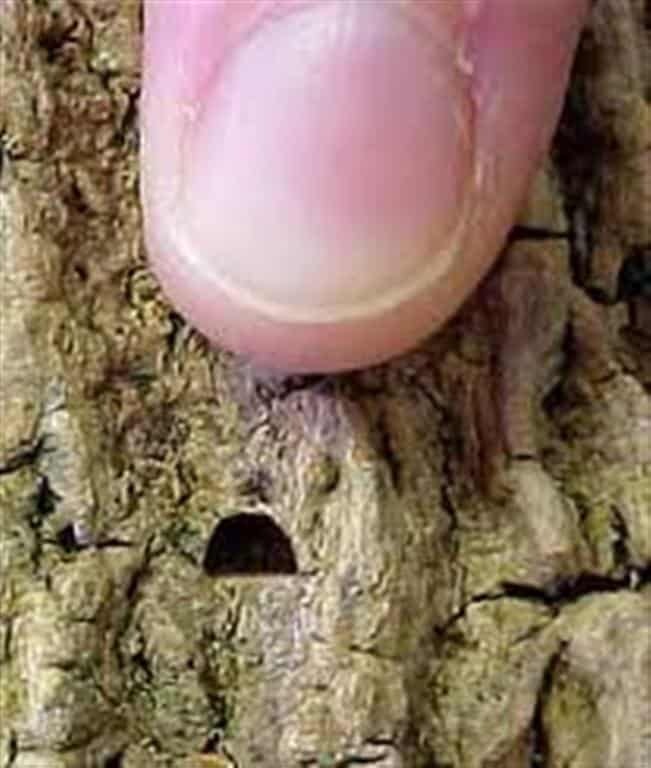 It isn’t easily detected in the early stages of infestation of a tree. – The beetles burrow underneath the tree bark, creating small, D-shaped holes along the trunk. They plant their larvae inside the bark, which cuts off the flow of water and nutrients to the tree. The leaves begin to die, and if left untreated the tree starves to death within two to five years. – Emerald ash borer beetles are likely coming to an ash tree near you, and the long-term damage cost for the City of Peterborough is an estimated $5 million. – It could cost individual homeowners a minimum of $1,000 to cut down infested trees, according to Green Up. That doesn’t include the money, time and energy invested in re-planting. – Injection of a bio-insecticide such as TreeAzin into the base of healthy ash trees every two years can prevent the infestation, or can wipe out an already-existent infestation. The inoculation must be performed by an arborist, however, and can cost an upwards of $200. It can’t be done after Labour Day, since the trees go dormant in the fall. – One of the easiest ways to prevent the spread of the emerald ash borer is to refrain from transporting firewood to and from the cottage or campgrounds the City of Peterborough has installed the first of its road signs (on The Parkway near Sir Sandford Fleming Drive) to remind visitors and the community about the danger of moving firewood. – Trees die two to three years after they have been infected and the dead trees can topple over since the trees rot out at the roots, according to Harri Liljalehto, who works at the Invasive Species Centre in Sault Ste. Marie. 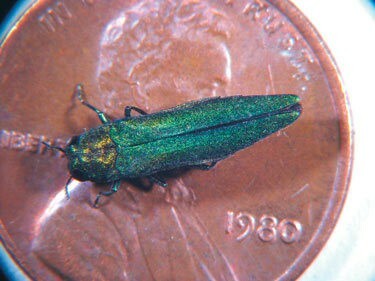 For more information on the Emerald Ash Borer, click here.